This is the same James Beard recipe with variations that I have used before. 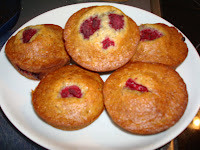 This time I had three bananas waiting in the freezer and I wound up with a bit of extra batter, so I made muffins as well as a loaf. S, who was a surprise play date this afternoon, ate two. 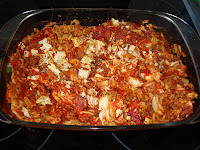 This Cabbage Roll Casserole is great. Tastes quite a bit like one of my favorites, stuffed cabbage, but takes no effort to make. The German had picked up bak choy instead of cabbage by accident, so I used that. No sauerkraut, more onions and garlic, I used tomato juice instead of water and tomato paste and at the half hour mark I topped up the pan with a box of Italian pureed tomatoes. It tasted great. Bring to a boil and stir in rice. Place 1/2 of the cabbage in a greased baking dish; cover with 1/2 the rice mixture. cover and bake in 350 oven for one l hour. If desired you can put sauerkraut on top of the layers. Top with pureed tomatoes as well as adding diced fresh as desired, to keep moist. Yum. 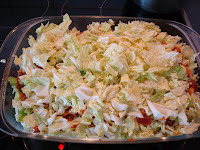 I've made that cabbage roll casserole several times and it was very popular and so easy compared to the real thing. 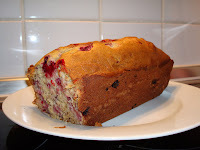 Banana raspberry cake sounds really good.